Haiku is simple! It is 3 non-rhyming lines of 5, 7, and 5 syllables respectively (a great way to use your fingers!) – join us and try it today! Next week’s theme: Numbers In celebration of a milestone birthday! Glad to have you join us! Next week’s prompt will be “Numbers”. oh these are so cute! I hated to see summer vacation end since I work weekends the school time off was the only time I had with the girls when they were young. I loved the last one too funny! I have been teaching for many years! It can be tough at times, but there are so many rewards too! I wouldn’t change! 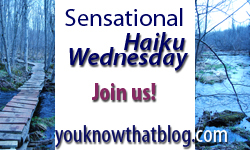 Love the range of advice and feelings in these haikus! Thanks for a fun prompt and good haiku! I cannot relate to your poem because we homeschool and I love having my kids at home everyday :). hee hee, fall is my favorite season. the red leaves, the orange pumpkins and the yellow school buses! Knew this one would appeal to you! Welcome aboard, Eric :) Glad to have you with us! Love the prompt…I always think when school starts I should be learning something…I can remember the days I rejoiced for the quiet on the first day…love your poem!! REminds me of that Staples commercial with the music for “It’s the most wonderful time of the year” in the background! Angie’s off for her second year at Temple. Has an oncampus apartment – she’s so excited about the kitchen – but she loves to cook. Once again, I’m getting used to cooking for 2! Last minute my post just melded with your prompt. Thank you again and wonderful week to you. Next week it’s all about numbers but a milestone? Hmmm…??? Wonder who’s milestone it’ll be about.? Not mine! :) Someone very important to me though. My little haiku is true. great haiku, Jenn. i especially love “Dancing parents laugh.” thanks for the prompt.